« Judge won’t hold NM adults charged with running a terrorist camp! Do Trump endorsements carry weight in local elections? YES! 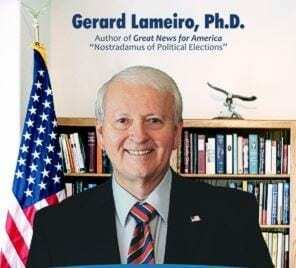 Author, Political Analyst, and Expert on Forecast Modeling Dr. Gerard Lameiro has called many of the Presidential elections even Trump! Predicts Conservative WAVE! Says the polls have built-in mistakes. Maybe they don’t realize that the electorate has changed. There are lots of polls in history that are famous for being wrong. Numbers don’t mean anything if you have bad assumptions. The Chinese are REALLY worried. They have no idea how to deal with someone like Trump who’s not a doormat. They’re used to people like Obama. Eventually we’ll get to the point where there are NO tariffs at all. It’ll be free and fair trade for all. Open trade brings on enormous prosperity. We just hit a 33 year high optimism outlook and the only thing the media wants to cover is Omarosa’s illegal recordings. How many of Democratic Socialist Ocasio-Corez’s endorsements won? NONE. ZERO. NADA. She’s so far off base that she may help the Republicans gain another seat! You have to be suspicious of someone who doesn’t like a 4.1% GDP and the jobs we’ve gained under Trump. We do have a Revolution going on in America right now, TOWARD Conservatism.